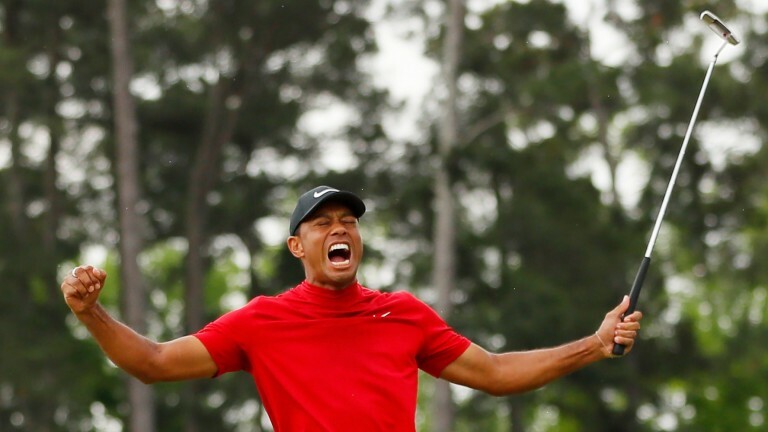 Jack Nicklaus has admitted he is worried that his long-standing record of Major victories is under threat after Tiger Woods won at Augusta on Sunday and bookmakers agree that the latest Masters champion has high hopes of catching the Golden Bear. Ladbrokes have chalked up 5-1 about Woods overtaking Nicklaus by reaching 19 Major triumphs before 2030. If 43-year-old Tiger remains healthy until then, the Magic Sign have given him 43 Majors to get the job done. Julius Boros holds the record for being the oldest Major champion in history – 48 at the 1968 US PGA – so the realistic time frame for Tiger is probably less than a decade. This is a man who has had four back surgeries, so his body could capitulate again at some point, but mentally there is nobody stronger. Tom Watson almost won the 2009 Open at the age of 59, so Woods seems unlikely to give up the fight until he stops qualifying for Majors. Bet365 have not put a time frame on the Nicklaus hunt, making Tiger 4-1 to reach 19 wins and 1-7 to retire without achieving his ultimate goal. Betfair, Betway and Paddy Power are less optimistic about future Woods success and are the firms for Tiger fans to attack. They go 10-1 about the five-time Masters victor getting 19 titles on the board to become the undisputed greatest of all time. This summer is arguably the key to whether the Augusta hero can reel in Nicklaus. Woods probably needs to register at least one more Major win to keep his hopes alive. Time is obviously running out, the screws in his back potentially loosening with every swing, and the three Major venues remaining this season offer an excellent opportunity for further inroads. Make no mistake – Woods is a serious contender for every Major again. He made bold bids for glory at the Open and the US PGA last year, and this term is off to a flyer. With the Majors schedule condensed for the first time this year – a Major a month for four months – he has only to sustain his form until July 21 to have the chance of making further inroads on Nicklaus's total. Next up is the US PGA at Bethpage Black, where he won the 2002 US Open by three shots, then comes the US Open at Pebble Beach, where he won that tournament by 15 shots in 2000. The Open at Royal Portrush, which has not been used since 1951, ends the 2019 Majors season. Links nous and course-management – Tiger strengths – will be invaluable in Northern Ireland in July and it is entirely feasible he could arrive at Portrush with Grand Slam aspirations. Hills and Ladbrokes are happy to offer 150-1 about a 2019 Tiger Slam, which was 1,000-1 at Christmas, but Betfair and Power go just 50-1, and bet365 are in the middle at 100-1. Woods is a best-price 12-1 with Betfred and Power for the US PGA, 9-1 favourite for the US Open and 10-1 joint-favourite with Rory McIlroy for the Open Championship.